HIGHLY upgraded single level home with UNOBSTRUCTED golf course views in a desired gated community! Lots of natural light and a refreshing breeze in this open floor plan. Direct access to the patio and to the walking path along the golf course from the living room and from the Master Retreat. Spacious Master Bedroom with a large walk in closet and a entirely remodeled bathroom with double sinks and private toilet / shower area. The well-sized second bedroom is located on the other side of the home and a full bathroom is located right in front of it - all for your own convenience. 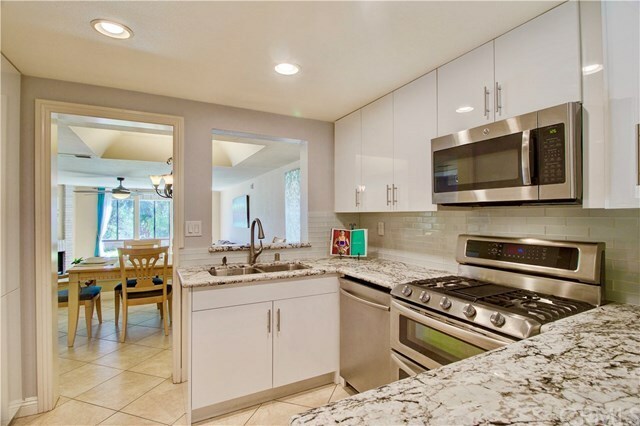 The chefâs kitchen has been fully remodeled and it has âMonte Lotusâ granite, self-closing drawers, double sinks, new built in microwave, stainless steel appliances and much more! Inside laundry with full size machines and plenty of shelving space AND a charming nook can be found next to the kitchen. Enjoy the magnificent golf course views while doing the dishes, sitting at the dining table or sitting on the couch while having the cozy fireplace on. One spacious car garage with plenty of built in shelves PLUS a designated carport. The Mission Viejo Lake is only a few minutes away! The community offers a heated pool, a spa, private parks / trails and a long practice golf green. Extensive HOA renovation's plan! All home pipes have been treated with Epoxy coating! Close to EXCELLENT schools, to scenic beaches, to the freeway and much more. A side gate offers DIRECT access to the home, hurry up! Directions: Use the second entrance - on Coso - in the gated Community. Upon entering make a right at first entrance, make sharp right again and go straight and park in uncovered parking space.